Posted August 2, 2017 by Alec Smart & filed under City Hub, Featured City Hub. On 29 December 2015, most families in Australia were enjoying the festive season together, looking forward to the forthcoming New Year. The Dungay family of Kempsey, likewise, was in buoyant spirits. David, son, uncle, brother, cousin, father and beloved member of the Dhunghutti Aboriginal community, was three weeks away from release after serving seven years in Long Bay penitentiary in Matraville, Sydney. David, 26, had endured a troubled childhood, and mental health problems – he was being treated for paranoid schizophrenia – ensured he would need many more years of professional support, but the punishment he received for transgressing society’s laws at a younger age was coming to an end as he anticipated his release back into the community. However, the night of 29 December was about to become a horrific nightmare for all concerned. David, a diabetic since he was diagnosed with Type 2 of the condition at the age of six, was in a solo cell in the hospital wing of Long Bay Prison, eating a packet of biscuits – Tim Tams, marketed in the USA as ‘Australia’s Favourite Cookie’ – to top up his blood sugar levels. His mother, Leetona, explains the subsequent incident that would scar her forever. According to a leaked report from the NSW Health Department and reported in September 2016 by PM, ABC Radio’s flagship current-affairs program, the officer then decided David was being ‘combative’ and ‘increasingly aggressive’. The Corrective Services decided to relocate David to a different cell equipped with CCTV coverage, so he could be better monitored, and summoned an Immediate Action Team – a SWAT-style unit trained to employ maximum force – to perform a ‘cell extraction’ on David. A team of guards decked in riot gear then advanced on David, restrained him and carried him to the other cell. David was pinned face down on the bed mattress while a nurse injected him with a sedative, midazolam hydrochloride. Unfortunately, these were David’s last words. It appears David’s cry for help went unhindered by the IAT officers subduing him, because he subsequently suffocated and, at 3.42pm, after 40 minutes of cardio-pulmonary resuscitation, ambulance officers declared him dead. An autopsy report performed by pathologist Kendall Bailey, which was leaked to ABC Radio’s PM program, reveals that soon after he was injected, David’s face turned purple and the 26-year-old stopped breathing. Midazolam, pronounced meh-DAZE-oh-lam, is a benzodiazepine (ie, quick-acting sedative), which produces a calming effect on the brain and central nervous system, causing sleepiness and muscle relaxation. Marketed under the trade name Versed, midazolam is a medication used commonly in hospitals for reducing anxiety and relaxing a patient prepared for surgery, prior to anesthesia. However, according to the drugs information website, Drugs.com, midazolam “may cause severe breathing problems (e.g., respiratory depression, respiratory arrest), especially when used for sedation in noncritical care settings. The autopsy report, whilst stating the cause of David’s death was ‘unascertained’, admits that ‘several abnormalities’, may have been contributory factors. Among those listed were the physical force used by the IAT guards during the cell extraction, that David’s neck was compressed, and that he was twice placed in a face down position that might have restricted his breathing. “The compression of the torso in a prone position may reduce the air entry into the lungs. This may result in hypoxia/cardiac arrest,” the report stated. The autopsy also found the presence of food in David’s lungs, possibly the result of vomit being forced back into his airways during the 40-minute CPR attempt at reviving David, and it concluded it could not be ruled out as a contributing factor. Newhouse hopes that any prison officer found responsible for David’s death be held accountable, although the officers involved returned to duty and none were suspended during the Corrective Services NSW internal investigation. “The Dungay family want changes made in the healthcare system and in the way cell extractions are undertaken to make sure no one ever dies in this way again,” Professor Newhouse said. 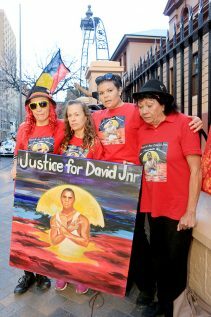 On Friday 28 July 2017, the campaigners and relatives of David Dungay rallied outside the Parliament of NSW building in Macquarie Street, Sydney, to demand a public inquiry and refute the NSW Police and Department of Corrective Services reports, which concluded that there was nothing suspicious about David Dungay’s death. Speaking at the July 28 rally, Leetona Dungay said, “We are all here today to get some answers from the NSW Government. “David was in a hospital wing inside the prison, so where was all the equipment to help save his life, and where were the doctors and nurses at the time of his death? “Didn’t they have a Duty of Care to look after him? “What were the Correctional Services officers doing? The matter is still before the State Coroner although no date has been set for an inquest, despite 17 months elapsing since David’s death. It will likely get a hearing later this year or early 2018.